A Look Back at the Battle of Massawa!!!! After the fall of Afabet, Moscow was effectively finished with Ethiopia. The Soviet Union’s military establishment started withdrawing its advisers and stopped its shipments to Ethiopia. To keep the free flow of arms and its addiction to modern battlefield weapons going, the Ethiopian government started trading Falashas, Ethiopian Jews, for Israeli cluster bombs that would later be used to bomb residents of the port city of Massawa. Eritreans were familiar with the plethora of bombs used by Ethiopian air force, including the banned napalm because Ethiopia’s air force had been bombing Eritrea to smithereens for 30 years. The banned napalm bombs were used by the Ethiopian air force extensively on civilians and tegadeltis. Eritreans were very familiar with the napalm bombs because they stick to the skin, cause severe burns and create large amounts of carbon monoxide to asphyxiate you. If water boils at 100 degrees Celsius, napalm generates temperatures of 800 to 1,200 degrees Celsius. But the Israeli Cluster bombs were a new kind of bomb. The cluster bombs were particularly devastating to Eritrean civilians because they released small bomblets upon explosion to disperse over a wide area and shred the crowded streets. When, in February 1990, the Eritrean People’s Liberation Front (EPLF) captured Massawa in a daring land and sea operation, the colonial Ethiopian government responded with relentless bombing of the port city, dropping cluster bombs to punish residents of Massawa. 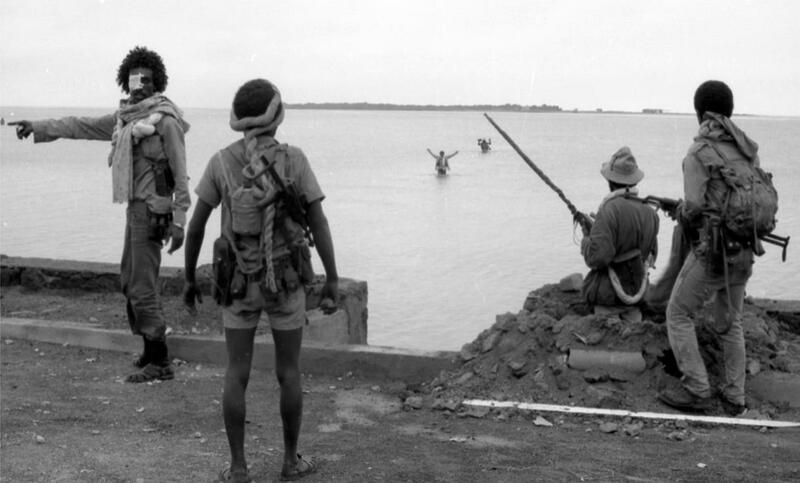 The EPLF had once before come very close to liberating the port city of Massawa in 1977 and was on the verge of victory, but its offensive failed to reach the heavily fortified naval base and the two islands around it, in part because it coincided with the arrival of the added firepower of Soviet arms in Eritrea with Soviet advisors taking a direct combat role. Soviet technicians operated the rocket launchers and long-range artillery while Soviet battleships offshore bombarded EPLF positions. The 1977 failed offensive on Massawa was the last major battle against the American-backed colonial Ethiopian Army of Haile Selassie and the first confrontation with the new Soviet-built colonial army of Mengistu Hailemariam. It would take about a decade for the EPLF to completely break the Soviet rock into pieces by taking a chisel to it. The 1990 Battle of Massawa began on February 8th at 1:00 A.M in a land and sea operation. This time the EPLF came with dozens of tanks, Stalin Organs (BMs), shoulder-fired missiles, and much heavy artillery, all of it captured from the enemy. The EPLF offensive, a.k.a Operation Fenkil, was launched on three fronts against the colonial Ethiopian Army: The She’eb Front to cut-off the Asmara-Massawa Road at Gahtelay, Mai Atal and Dogol Front to destroy the colonial Ethiopian Army stationed along the route to Massawa, and the Woqiro Front for the mechanized brigade to link-up with the EPLF Navy operating a flotilla of speedboats and move along the coast to Massawa. By 6:00 A.M the offensive on the She’eb Front had succeeded spectacularly. The EPLF completely destroyed the 6th division of the colonial Ethiopian Army and took over its command and control center while tegadelti troops raced with each other to control the Asmara-Massawa road. The offensive continued on the two other fronts into the second and third days to route the enemy out of its strongholds in Massawa. It was a fierce tank battle. Unlike in 1977, Massawa’s mainland neighborhood of Salina, the narrow causeway of Segalet that connects the mainland neighborhood of Edaga to Tualet, the naval base and the islands around it were captured by the EPLF. The battle went quickly and decisively in favor of the EPLF this time, but the aftermath was brutal. The Ethiopian air force bombed Massawa, the Pearl of the Red Sea, for ten straight days using cluster bombs, killing and wounding hundreds of civilians. The fall of Massawa cut-off the Asmara-Massawa road making Asmara accessible only by air, which made it expensive for the colonial Ethiopian Army to supply its ground forces in the highlands of Eritrea. Weeks later, the EPLF swept south and took Senafe, Adi Qayeh and Segeneiti, pushing to within a striking distance of Dekemhare. Nearly 8,000 troops of the colonial Ethiopian Army along with its highest ranking army generals and naval commanders surrendered to the EPLF in the Battle of Massawa. The Battle of Massawa was mostly a tank and anti-tank battle. Three of the EPLF tanks to reach Massawa Harbor during Operation Fenkil are now memorialized on Tualet Island. Be sure to visit the Tank Memorial in Tualet if you are in Massawa. If you are planning on visiting Eritrea this month for the Silver Jubilee Anniversary celebrations and rub shoulders with Independence Week revelers in Asmara, be sure to make the trip down to Massawa and spend at least a half-a-day at Gurgusum Beach. Take your beach blankets to Gurgusum and enjoy its wonderful sea-breeze and salty air. Just sit there for a couple of hours on the beach and enjoy listening to the crashing waves of the Red Sea that bring sand and unique shells. Go in the water for a swim. Walk around the sandy beaches of Massawa and imagine what it must have been like for tegadeltis to storm the same beach you’re standing on 26 years ago in a daring land and sea operation. And may be take the sunset ferry to Green Island and lay a wreath somewhere on the water for the fallen heroes of Operation Fenkil that made it all possible. Re: A Look Back at the Battle of Massawa!!!! I remember the day EPLF decimated the entire Derg Mechazsed Brigades that consist of 150,000 plus soldiers and the entire Ethiopian Naval Force and captured Massawa within 4 days battle from 3 fronts. Living in Greece at the time, we had spend days and night dancing and drinking at our community center. It feels as if it was yesterday. Just weeks later, we received the actual battle VHS video from Massawa and we were glued to the TV for hours. There were a many young men and women who left for "Meda" from their conformable life in Greece and joined their brothers and sisters in Sahel to finished off the Derg after the fall of Massawa.